Taguig is in the Southern Part of the Metro so it's really a hassle if we don't know what means of transportations to use to get there and visit the extravagant and wonderful places in it. 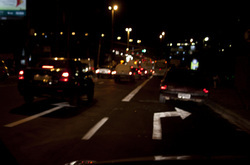 It is really a lot more convinient to bring your own vehicle in roaming around the city! So, full your gas and ready your gears in setting forth the Global City! Part of the fast-growing city is the E3. 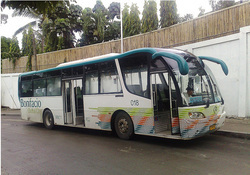 It's an eco-friendly vehicle which lessens the pollution around the city. 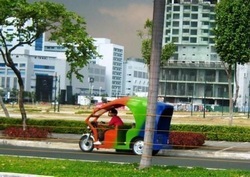 This is the newest means of Transportation around the Global City! It's follows the Bonifacio Global City-Kalayaan-Market! Market! route. The fair is really affordable and indeed, reasonable. For only P10, you enjoy the convinience you need to roam around the city without hassle! Passengers begin to experience the full enjoyment at 5 AM to 2 PM the following day, with waiting time at the loading bays not more than 15 to 20 minutes, with at least seven stops during the 10-minute trip. Cool, isn't it?